Confessions of a Ribbon Addict: Blue? She is stamped in Memento Tuxedo Black and colored with Copic markers. I am STILL using the Love Me Do patterned paper by My Mind's Eye. I got mine HERE, but QUICK, there is only one pack left! 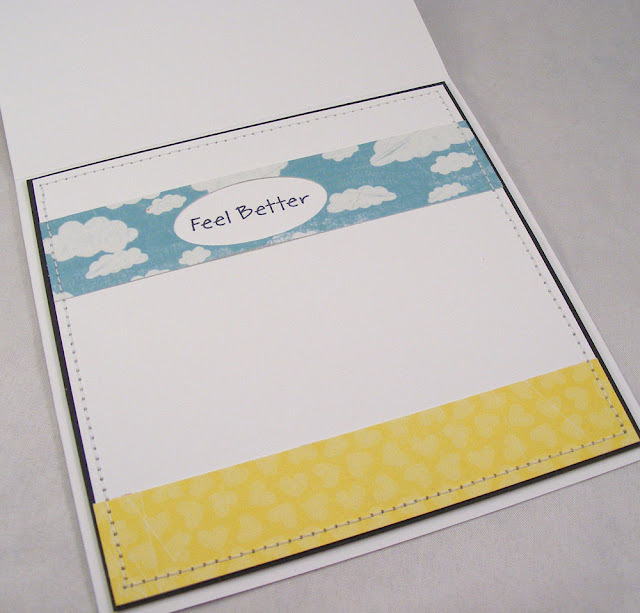 I am in love with the cloud patterned paper and will be so sad when my sheet is gone (which is in about ONE card LOL). I used Stickles on her boots and pockets (because cute little girls TOTALLY sport glittered rain boots right?). I drew in a puddle with my BG10 marker and then covered it entirely with Diamond Glaze. REMEMBER, when you use Diamond Glaze put it on and then WALK AWAY... for the night. Put it somewhere and don't mess with it until it is completely dry. Beautiful card. I love the Diamond glaze touch - greeeeat advice BTW. Spoken like someone who has learned from experience LOL. This is just adorable! I love her sparkly rain boots! 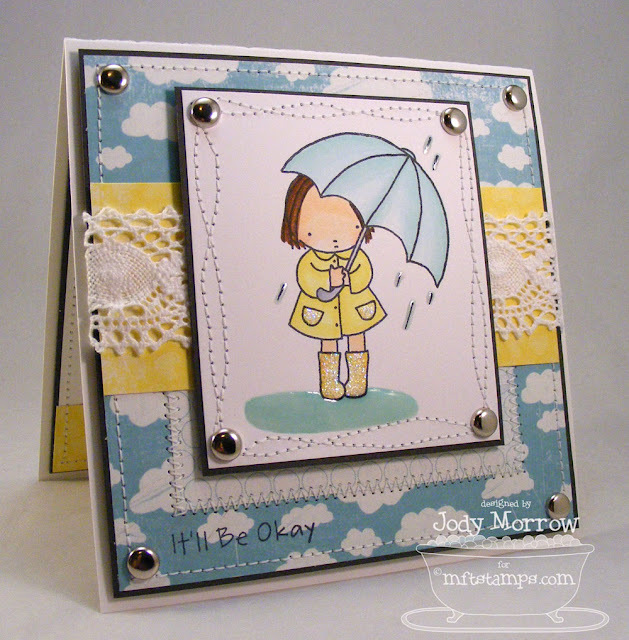 Your card is super duper cute and I love the puddle you created! Jody i always love your stitching, and brads. Lovin that paper, and glitter makes me smile. 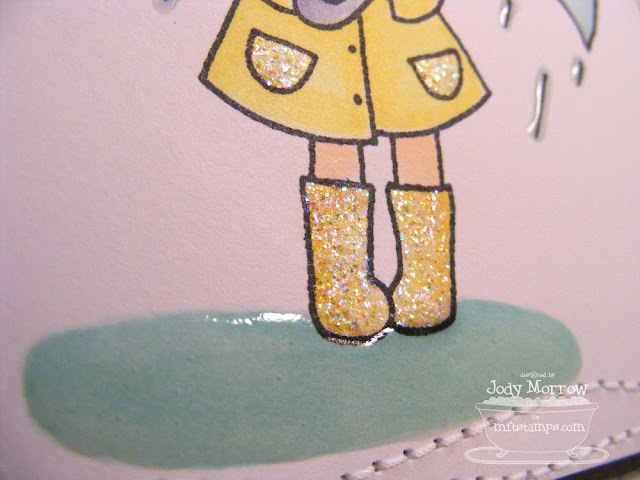 How fun to stomp puddles in glittery rainboots! 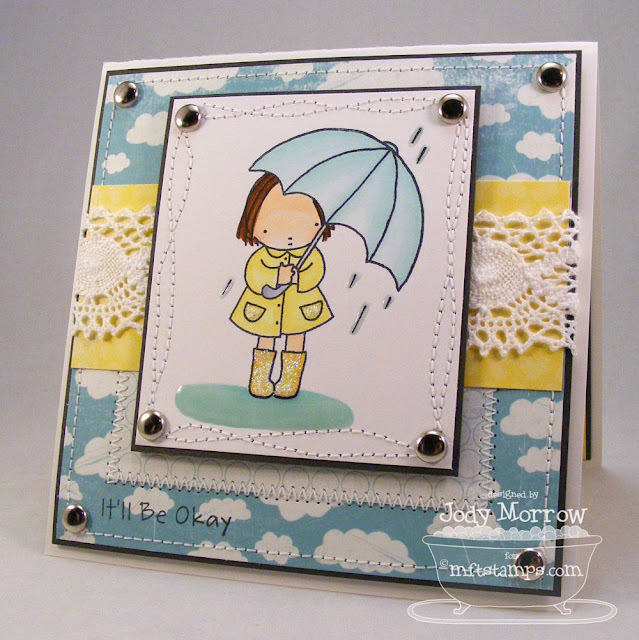 LOL Love the card and I really like how you added the Diamond Glaze to the puddle - great effect! You color your images so well. I wish I knew how to use the copics because colored pencils just don't do a stamped image justice. BTW/your card is super cute. Love how you did the little puddle. jodi..this is precious! love the colors, the papers, the glittery boots, the shiny puddle...LOVE IT ALL! This is just too cute!! Love it!! Totally adorable. Love the glitter accents and the diamond glaze puddle is such a fun touch. This is gorgeous! And your stitching is top knotch! What a beautiful card! I love the stitches that you put as a border. Stunning card! I love these images and can't get enough of them!!! You did an awesome job with this card!!!! Especially like the way you did the stitching around the girl - it adds a lot of visual interest. Do you use a certain type/brand of thread? It looks thicker than any thread I have. I just came across your blog today - - and looked through a few pages. YOUR STUFF IS AMAZING!!! Can't wait to look through the rest of your blog. I love this card - it's incredibly sweet! 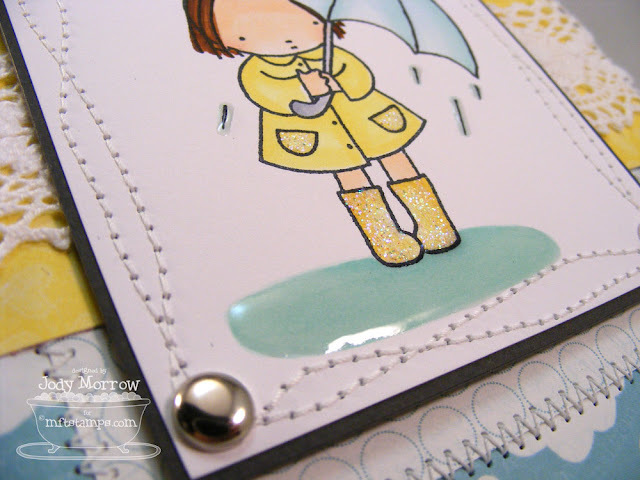 The glitter boots and "wet" raindrops and puddle are the perfect touches - the template is great and the little sad sentiment . . . so sweet. Really nice work! Bookmarked this. Thank you looking for sharing. Unequivocally advantage my time. Another amazing card!! Love the puddle and glittered the boots, perfection! Beautiful card!!! I love the stitching and lace ribbon! Of course she HAS to HAVE sparkly boots and pockets!! :) Are you kidding??!!! And love the puddle!